The International Water Summit (IWS) 2016 is set to attract global experts, decision makers, and business innovators to address the impending water demand and supply gap in the Middle East, and the challenges and opportunities to ensuring water sustainability in the region. According to a recent study by Frost and Sullivan commissioned by the IWS, countries in the GCC have the highest per capita consumption of domestic water in the world, reaching 1,600 litres per day per person. Limited availability of freshwater and renewable resources, coupled with their large-scale inefficient use, is further widening the demand-supply gap, according to the 2015 report. A separate study by the World Bank shows that as the Mena region’s population continues to grow, and is projected to double over the next 40 years, per capita water availability is expected to fall by more than 50 per cent by 2050. Held under the patronage of General Sheikh Mohammed bin Zayed Al Nahyan, Crown Prince of Abu Dhabi and Deputy Supreme Commander of the UAE Armed Forces, and hosted by Masdar as part of Abu Dhabi Sustainability Week, IWS offers industry stakeholders a knowledge-sharing platform for exploring and accelerating the development of new sustainable strategies and technologies. Connecting decision makers with solid opportunities for industry development is key to making the prospect of water sustainability a reality, say experts. “Projections of significant population growth in the region is making it critical that water demand is met with sustainable regulatory strategies that not only promote efficiency, but also safeguard quality and maximise the potential of this vital resource within the water-energy nexus,” says Saif Al Qubaisi, acting director general at the Regulation & Supervision Bureau – Abu Dhabi. “Stakeholder collaboration and developments in technology play a fundamental role in making this possible. IWS enables industry progress and innovation by bringing experts, investors, and decision makers under one roof to exchange new ideas and share best practice,” Al Qubaisi adds. Coming back for its second year as IWS’ flagship business generating programme for the water sector, [email protected] will enable innovators and clean technologists to connect with investors, partners and end users in the quest for sustainable water in arid regions. The IWS Conference Programme will bring together 90 thought-leading speakers to the stage to discuss imminent issues facing potable water production, from the Middle East’s future desalination projects and energy efficiency in water production, to sustainability’s role in business, and a country spotlight on the region’s largest investor in water projects – Saudi Arabia. Experts include Dr Taha Ouarda, head of the Institute Centre for Water and Environment (iWater) at Masdar; Thierry Mallet, executive vice president for Innovation, Marketing and Business Performance at Suez Environment in France; Carlos Cosín Fernández, chairman and CEO of Abengoa Water in Spain; Dr Abdullah Abdulaziz Al-AlShaikh, CEO of Advanced Water Technology (a subsidiary of Taqnia) in Saudi Arabia; and Dr Masood Al Rais, senior manager of Desalination Operations and Water Marketing at Emirates Global Aluminium. The 2016 edition of IWS is expected to welcome 180 exhibiting companies from 35 countries, and around 10,000 attendees from more than 70 countries. 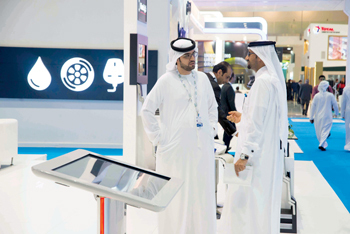 The event, which is held in strategic partnership with the Abu Dhabi Water and Electricity Authority, will take place at the Abu Dhabi National Exhibition Centre from January 18 to 21, 2016.